Fourth Quarter 2018: Market Outlook & Portfolio Insights. As Mr. Marks points out in his memo, the third quarter of 2018 represents a significant anniversary for the economy and markets with September marking the ten-year anniversary of Lehman Brother’s bankruptcy filing, the final stage of the market collapse associated with the financial crisis and ultimately, the extraordinary monetary policies associated with the current economic recovery/expansion. While we subscribe to the view that dates/tenure alone have little predictive power regarding future economic activity or market returns, certain characteristics and market behaviors can be discerned over the course of a cycle which guide future expectations and portfolio positioning. This cycle appears to be no different. Our intent in this missive will be to describe the dynamics that have supported recent economic expansion and market returns, as well as highlight areas of potential risk building in the markets that form our increasingly cautious stance towards financial markets. 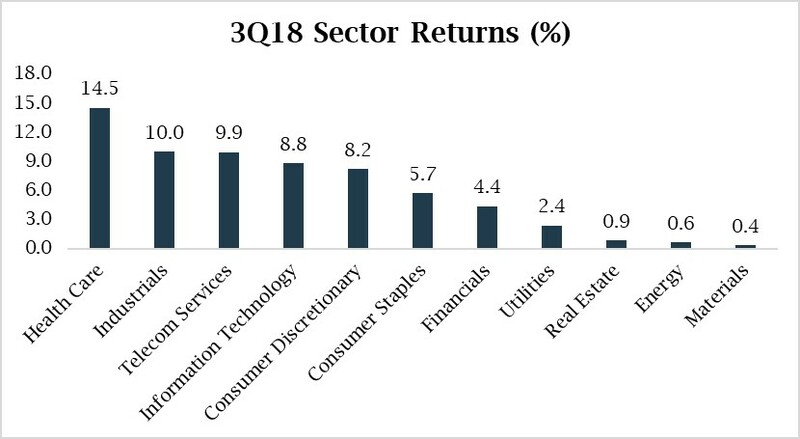 Financial markets in the third quarter continued along the path that has characterized the expansion since the recovery’s inception: namely, domestic equities have continued to lead the charge to higher returns. As the accompanying chart depicts, investors have been rewarded for remaining focused on domestic markets, particularly domestic risk assets, with diversification coming at a “cost”. The combination of solid economic growth and resultant earnings growth coupled with continued accommodative financial and fiscal conditions propelled domestic stocks higher while international markets continued to reflect weakening underlying fundamentals, a departure from the synchronous global recovery evident a year ago. The recovery in small caps stocks this year has represented a healthy broadening of equity market returns on the surface, however, the concentration of performance in growth stocks reflects a continuation of returns concentrated in a few sectors (and stocks) in the market. As mentioned in our Portfolio Insights note last month, the themes that have been driving the market over the course of this expansion appear to be reaching inflection points that influence our view with respect to building risks in capital markets. The economic expansion to date has been characterized by below average growth, contained inflation, accommodative monetary and fiscal policy and strong financial market returns. 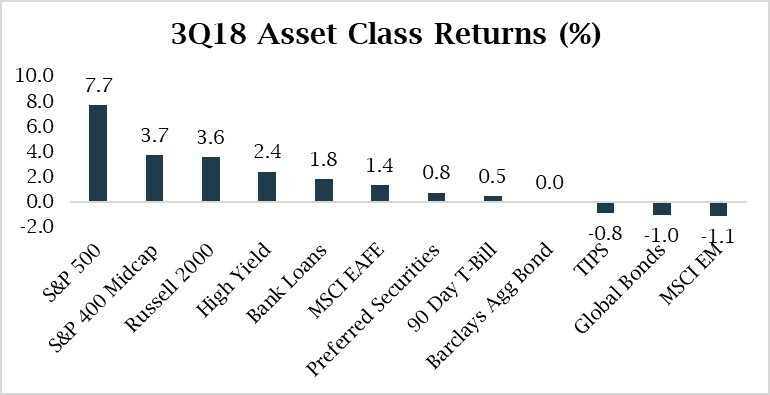 As mentioned above, a few major themes have played out over the course of this expansion: namely, domestic equity outperformance versus international equities, growth equities outperforming value equities, the disappearance of cash as an asset class and the resultant impact on equities, and the lack of inflation. While these themes have been a rational response to the underlying fundamentals of the economy, a number of relationships have reached levels that call into question the ability of these themes to be sustained going forward. It is these views with respect to economic fundamentals, monetary and fiscal policy, and valuation that form the basis for our portfolio allocation decisions. We have remained constructive on the economy, in spite of the extended length of this recovery, based on a view that the typical excesses associated with a late stage economy were not present. While we agree with our partners at BCA Research that a recession in 2019 is a low probability event, we believe the economy is beginning to reflect more traditional late cycle characteristics with implications for portfolio positioning. Focusing on monetary policy, the Federal Reserve continues to move away from the extraordinary levels of accommodation associated with this cycle. Short-term interest rates have been increased three times in 2018 with expectations of an additional increase in December. At the same time, the Fed has been reducing the size of its balance sheet at an increasing rate to remove further stimulus for the economy. The combination of unemployment rates at 50-year lows, wage growth accelerating and an economy operating above its potential for the first time in this cycle (see the chart above) suggests inflationary pressures may be building. While current expectations suggest the Federal Reserve will remain measured in raising interest rates, a critical question for investors is whether the Federal Reserve will be required to more aggressively raise interest rates to moderate building inflation pressures. This would represent a material change to the backdrop of accommodative monetary policy that has characterized this cycle. 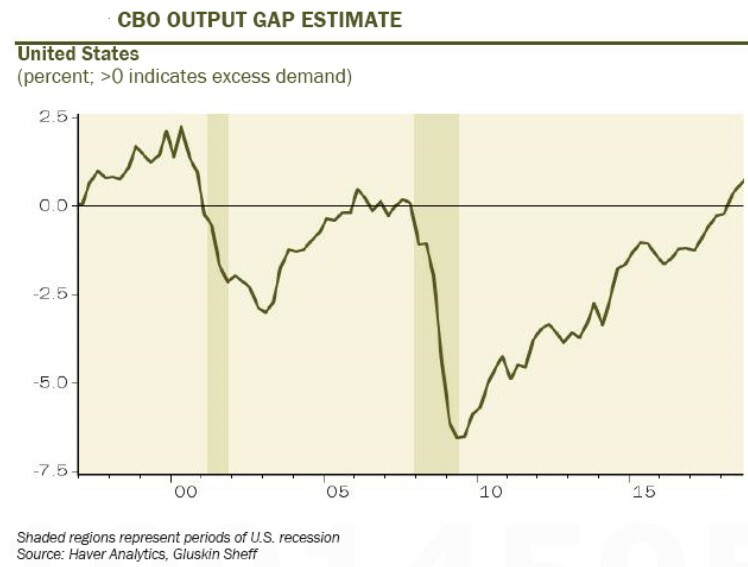 As BCA Research points out, a favorable view of the economy remains appropriate given positive business investment trends coupled with continued solid household spending, easing lending standards and continued fiscal stimulus. There are pockets, however, of growing risk that bear mention. Corporate debt, after briefly contracting in the aftermath of the financial crisis, has reached record levels in this cycle in absolute terms and relative to GDP. The combination of narrow credit spreads and easing credit standards has boosted the use of leverage, particularly in the lowest quality tranches of the investment grade market, where BBB rated debt now represents 50% of the market. 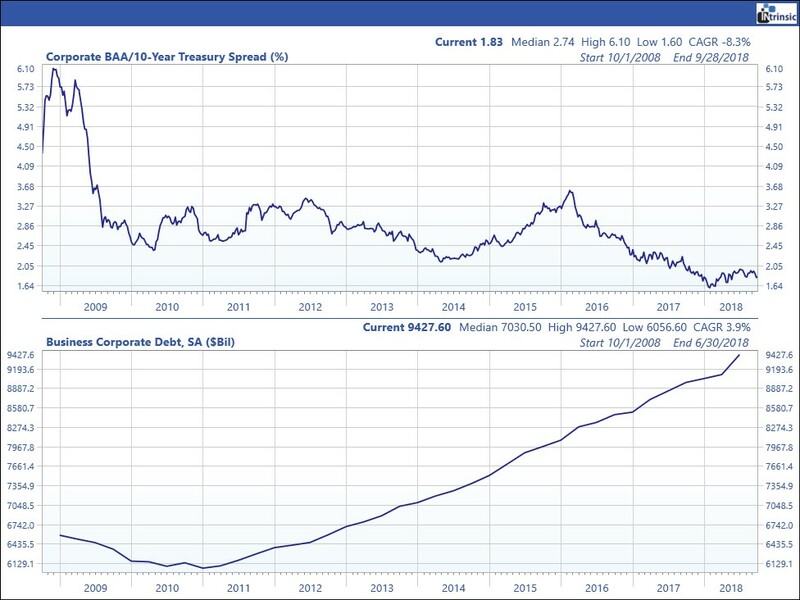 While debt coverage ratios are high and delinquency rates are low, credit spreads require the sustainability of these trends into the future, a potentially optimistic view. Similarly, in looking at the equity markets, the combination of solid underlying growth and reasonable valuations suggests a continued constructive view towards equities. However, the backdrop for equity markets is shifting. Prospective long term returns for equities are most favorable when valuations and expectations are low as the market is extrapolating weak trends further into the future than are ultimately realized. Similarly, as confidence grows, profit margins increase, earnings expectations rise and valuations expand, the level of prospective long term returns is diminished while risk begins to rise. 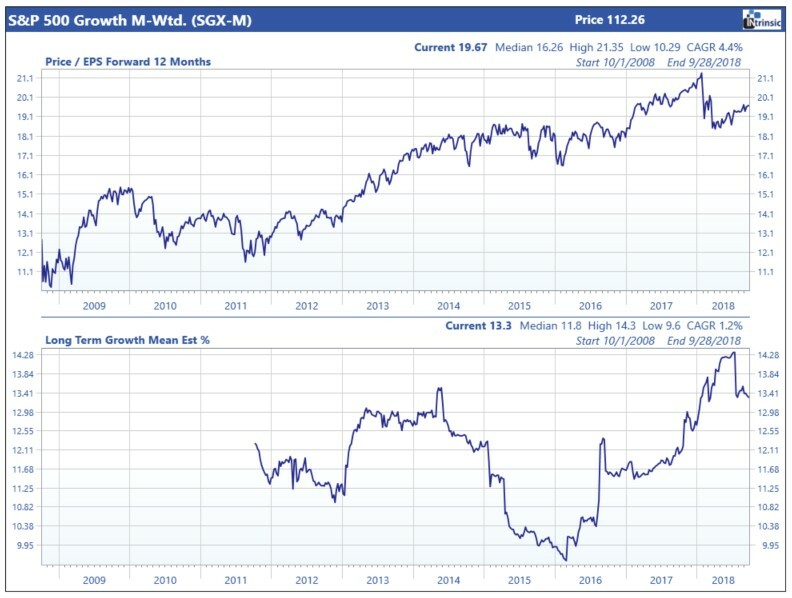 The chart below depicts the Price to Earnings ratio for the S&P 500 Growth index coupled with long term growth expectations. Expectations for future earnings growth are at the highest level in this cycle after profit margins have expanded to record levels and confidence is high. At the same time, interest rates appear to be offering an increasingly compelling alternative to equities with 90 Day Treasury Bills offering a yield above the S&P 500. While none of these signals suggest a recession or market downturn is imminent, they are reflective of shifting risks within the markets. In positioning our clients’ portfolios, we will continue to weigh long term return expectations versus the risks that we identify within capital markets. Given continued solid underlying economic momentum and reasonable valuations outside of a narrow group of higher growth businesses, we continue to manage portfolios in line with strategic allocations while taking into account our client’s ability to accept volatility and specific liquidity needs. In equity portfolios, we are deemphasizing the “growthiest” areas of the market given high valuations and expectations while remaining biased to domestic markets. In fixed income, our investments have been shorter in duration to lower the price risk associated with higher interest rates. While the yield curve has recently steepened, we continue to see greater value at the short end of the yield curve. We will continue to focus on potential areas of risks within the economy and capital markets and will proceed from here with caution as our mantra.